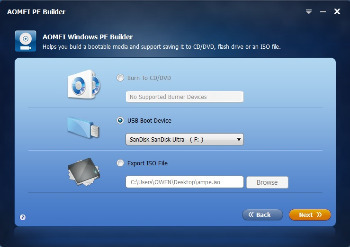 AOMEI PE Builder portable helps you to create a bootable environment based on Windows PE without installing AIK/WAIK, which integrates a set of tools that enables you to boot up your computer for easy maintenance and fast recovery tasks when the native system is corrupted or cannot be used. AOMEI PE Builder is a free assistant to AOMEI Backupper or AOMEI Partition Assistant, and a freeware to create a bootable environment into CD/DVD, USB flash drive or ISO file based on Windows PE (Windows Pre-installation Environment) without installing AIK/WAIK, which integrates a set of tools that enables you to boot up your computer for easy maintenance and fast recovery tasks when the native system is corrupted or cannot be used. When creating bootable media based on Windows PE, AOMEI integrates desktop, Windows explorer, start menu, and taskbar into the WinPE environment. This makes it easy and effortless for you to manage files and documents, just like using Windows operating system. To create a Windows PE media, typically you have to pre-install Windows AIK or WAIK, or prepare a Windows installation disc. Luckily, AOMEI PE Builder allows you to create a WinPE media without installing AIK/WAIK. It will save you valuable time and energy! Except many built-in tools in AOMEI PE Builder, you can still specialized your own Windows PE through the following two functions. Add Files: It supports including more portable tools you like into Windows PE bootable media. Add Drivers: In order to make Windows PE recognize more hardware, it enables to add drivers to Windows PE bootable media. Off-line antivirus: How to do when the computer is locked and can’t remove viruses/Trojans due to viruses attack? Off-line antivirus is a good solution. Downloading directly the off-line version of anti-virus software in the Windows PE system created by AOMEI PE Builder, you can antivirus off-line. Maintain system with convenience: If you are system administrator, through Windows PE which supports network connection you can easily maintain systems of computers which have different hardware. For example, you can easily backup system to NAS or network shared directory. Support to download Windows 10 recovery environment to create a Windows PE bootable media. Support to cancel the operation during the process of creating a Windows PE bootable media. Added dual-boot function: a Windows PE bootable media supports both EFI and Legacy BIOS boot modes. AOMEI PE Builder fully support Windows 10.